We all know about the Blockchain technology as the underlying invention of the most popular cryptocurrency Bitcoin. Bitcoin is a groundbreaking invention that took the world by surprise. A single Bitcoin was initially valued at $0.08, and somehow that price has reached its peak at $17,900 in December 2017. However, we’re not here to talk about Bitcoin. We’re here to talk about the amazing invention that makes Bitcoin possible, the Blockchain. Blockchain is a data decentralization system. The Blockchain distributes data to many computers within its network called ‘nodes’ and use the similarity (or dissimilarity) to validate certain information. Blockchain was invented by a group or individual under the pseudonym of Satoshi Nakamoto. Their true identity remains to be seen, but their invention has inspired thousands of startups to launch their own cryptocurrencies. Other famous cryptocurrencies such as Ripple and Ethereum are also based on the Blockchain technology. Not only companies, several countries also embrace the Blockchain technology. Before we go into what we can do with Blockchain, let’s talk about the advantages that it offers. Blockchain is an invention that can be applied to develop all sorts of software and applications. In order to figure out which industry can make use of the Blockchain, let’s list out the advantages that it offers. The first and most obvious feature of using the Blockchain to develop a new product is its improved security. The decentralization concept that the Blockchain has offers a significant improvement in security since there isn’t a central server for hackers to attack. This decentralization also makes data on a blockchain network more accurate. It happens because the data in the Blockchain network is permanent and can’t be tampered with. The only way to change the data is to overwrite it with a new ‘block’, which requires approval from the entire network participants. A decentralized network allows information transfer that requires validation to be directly executed without the need of third parties to confirm that a transaction is valid. The most practical application for this would be international fund transfer. Regularly, we would need to wait for a few business days before our transaction can be finalized. The banks involved will need to verify if the sender-receiver information and the amount of money sent check out. The nodes in the Blockchain network can do the same validation, but at a much faster rate. Blockchain can give power back to the people! In international transactions, banks would charge you a certain amount of fee to cover their employees labor. With Blockchain, which is a peer-to-peer network, you don’t need as many third parties or middlemen to make a secure transaction. Nevertheless, the transactions are just as secure, if not more secure. You also don’t have to review too many documents because the data is already stored and secure in the Blockchain. Blockchain shares the same document (instead of copies) to all nodes in the network. Every change made in a transaction or document is visible and traceable by every node in the network. The system works similarly to Google Docs, as in you can edit a document at the same time as others – but without a centralized server. Blockchain allows you to track transaction history more efficiently and accurately because every node in the network agrees on each change made. This accurate historical data can be used to verify the authenticity of assets or products and prevent fraud. Thousands of Blockchain-based startups have closed shop. It’s not necessarily because they had bad products. Many of them struggled with breaching their target market. Partly, this is caused by the minimum public understanding of what Blockchain is and what it can do when it’s applied to develop a product. Blockchain is already a complicated invention as it is. Using it to develop other software and programs adds another layer of questions. It is often the case that such a complex subject overwhelms people and discourages them from trying out a new product. So, how should you overcome this problem? Approximately 65 percent of the population are visual learners. By using an explainer video, you have a better chance of communicating with your audience using their preferred learning style. 90 percent of all the information transmitted to our brains is visual – this means that our brain is more used to receiving information that’s tied to an illustration. Like videos and infographics. Explainer videos are good, but they’re not meant to transfer information at a large scale. If you’re running a blockchain startup, chances are you rely heavily on your digital marketing and website. Writing a blog post that educates your audience about your product is a good addition to having a product explainer on your website. As a visual content, infographics obviously has a clear advantage over plain blog posts. 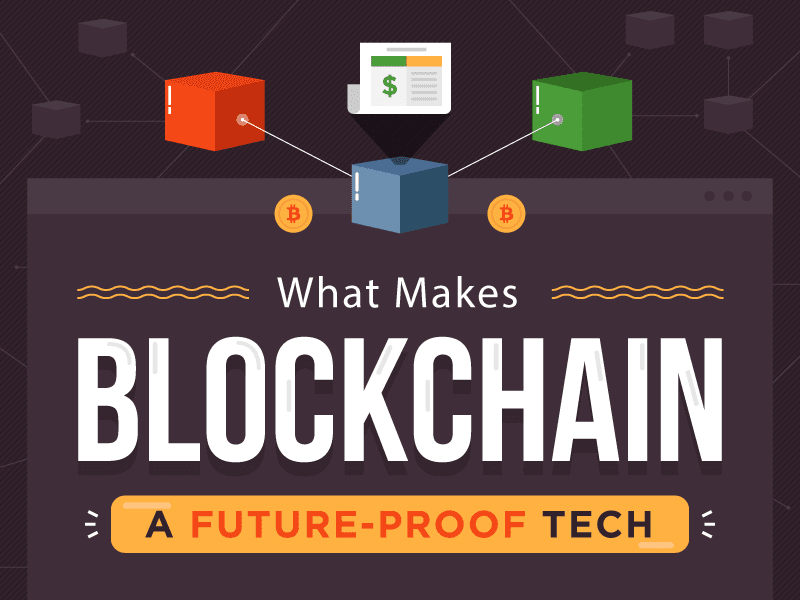 The combination between visual and text in an infographic can help to break down complicated subjects like Blockchain into smaller and more digestible fun fact. To convince you that infographics work, we’ve embedded an infographic on Blockchain created by Breadnbeyond. Take a look and see if you can learn more things about Blockchain from it.